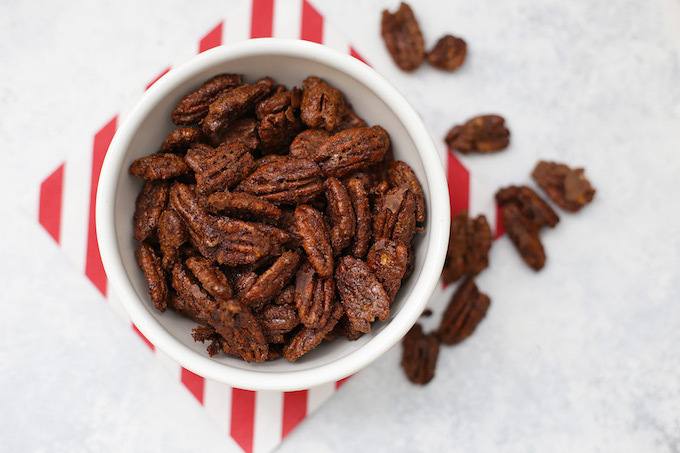 Cleaner Candied Pecans – These homemade candied pecans have all the amazing crunchy texture and sweet flavor without the sugar crash. Sweetened with coconut sugar, they’re a cleaner way to enjoy this treat! Years and years and years ago, my parents took us to a nativity and “Christmas around the world” display. Different booths were set up with traditions and foods from around the globe. 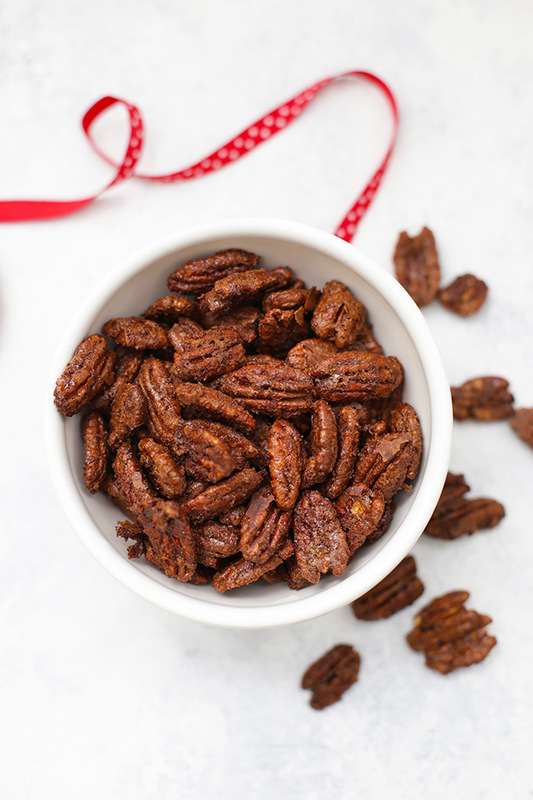 And, despite all the wonderful offerings, the ONLY thing I can remember with crystal clarity is the praline pecans from the southern United States. It was my first time tasting them, and I. could. not. stop. The crispy crunch, the sweetness and cinnamon, and toasty pecan flavor was so mind-blowing that I don’t remember at all what anyone else brought that evening. 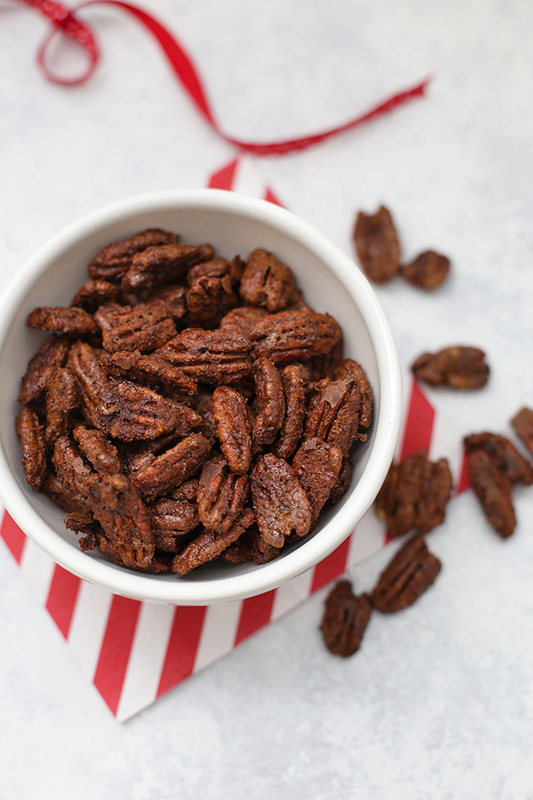 All I remember is going back for seconds, thirds, fourths, and, yes, FIFTHS of those candied pecans. Needless to say, I was an instant convert. The secret, I’ve learned, to that crispy crunch is using an egg white mixed in with the sugar. I’ve tried them other ways (since I know a lot of people are allergic to eggs), but it’s just hard to beat the amazing crunch that they bring to the table. The other secret (most of the time) is copious amounts of sugar. There are enough sugar highs and lows during the holidays that I’ve been looking for ways to clean up some of my old favorites, and coconut sugar has been my secret weapon. We use pure maple syrup, honey, and dates for a lot of things, but I love that coconut sugar gives the same texture as granulated refined sugars, and it’s pretty darn easy to substitute in a recipe (it’s a 1-for-1 substitute). Unlike most other coconut products, coconut sugar doesn’t really taste like coconut. Instead, it’s got a great caramel-y richness and depth that’s much more similar to brown sugar. 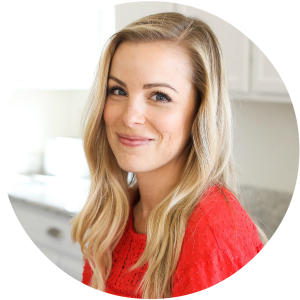 It’s also lower on the glycemic index, meaning it doesn’t cause the quick spikes and drops in blood sugar that white sugar does. It also has trace minerals, so even though it’s no health food, I feel okay using it when I’m making a treat! 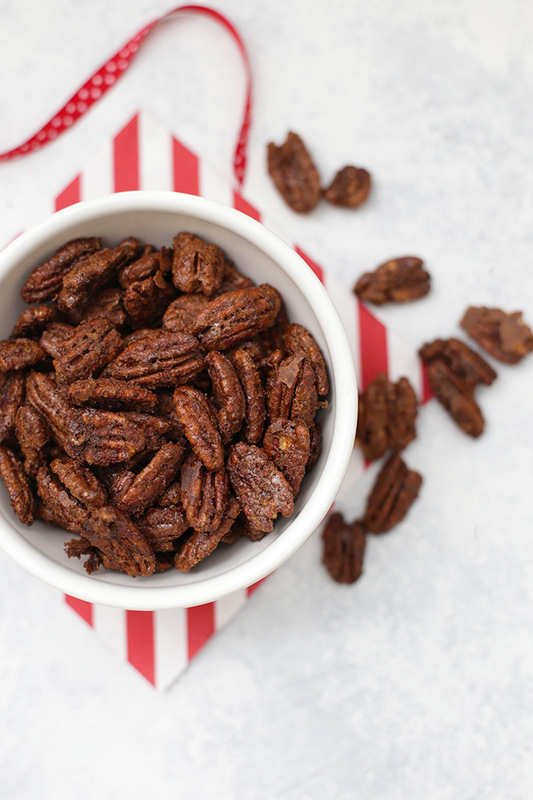 These pecans are just amazing. The same crispy crunch as the ones I couldn’t stop eating so many years ago, and the flavor is fabulous, sweet without making your teeth ache, and hitting all the right notes along with the cinnamon. They’re great on their own, tucked into bags for neighbor or friend gifts, or added to a special salad. All I’m saying is prepare to want thirds, fourths, and fifths. What about other nuts? The same method works for almonds or other nuts, if you don’t care for or are allergic to pecans. Just keep an eye on them, as walnuts can sometimes cook a little faster. Can’t find/don’t like coconut sugar? No problem. You can use maple sugar (my favorite), or you can use 1/2 white sugar and 1/2 brown sugar. Need an egg free option? You won’t get quite the same crunch factor, but these are VERY good, too. Other flavor ideas: You can skip the cinnamon, add an extra pinch of salt, or use my chai spice blend for different flavor options. In a medium bowl (or a zip-top bag), combine all ingredients. Stir or shake well to completely combine. Line a baking sheet with parchment paper and spread nut mixture out onto the baking sheet. Shake or spread out nuts in an even layer. Bake about 40 minutes, stirring every 10 minutes. Allow to cool completely (they’ll harden more as they cool). Enjoy immediately, or transfer to an airtight container for up to 1 week.